This would be a “Milestone Day”. 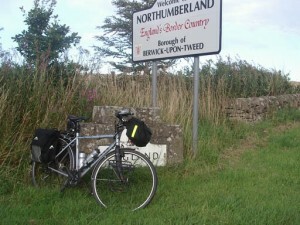 Today we would pass from Scotland into England. Today we would cross the City of Edinburgh. Today was our second +100 mile day. 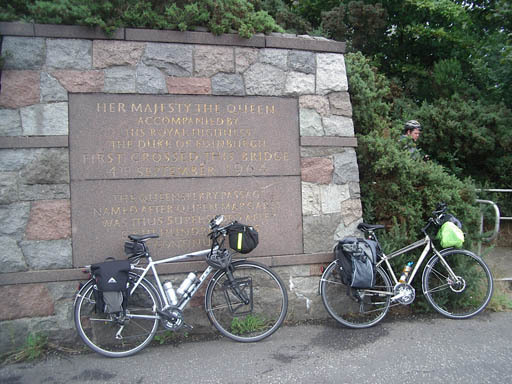 We left the comfort of the tents at 7am and set off to the cyclepath that took us alongside the A92 right down to Pathhead and Kirkaldy. Then the A921 round the coast through Kinghorn, Burntisland, Aberdour to Inverkeithing. We were making very slow progress. I stopped, and pointed out that we were currently doing an average of 7 miles per hour (including stops). If we kept this up it would take 14 hours to get home – 10pm. Shaun knew. He wasn’t eating and was exhausted. He also looked awful. I refused to cycle in front of him because he looked as though he could topple over at any point. I wanted to see this if it happened – not because I’m sick or anything, but if he was behind me, I wouldn’t know it had happened. 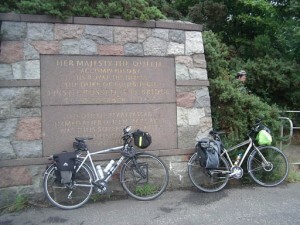 We set off again and reached the north end of the Forth Bridge. We stopped for breakfast, and Shaun said he couldn’t carry on. He would get to the other side of the bridge and phone Helen to pick him up. This is what he did. We waited at the bus stop on the south end of the bridge and they arrived after about 10 minutes. They took him off to Berwick for a rest. I set off again to make my way across Edinburgh. I felt more scared doing this alone than I had felt setting off to do the whole trip alone 2 years ago. Edinburgh is a big city, and I’m very small. I followed the red line on my GPS, and the blue Route 1 signs into Edinburgh. This turned out to be very simple indeed. Some residential streets and then suddenly an old railway line that took me right to the centre. Then the fun really started. There were roadworks and closures, and I just couldn’t follow the signs or the track. I seemed to spend ages backtracking, but in fact I only missed the proper route once or twice. Eventually found the cycle route out again (another railway path) and set off towards Pencaitland. Here I was pleasantly surprised to find another cycle path. This one through the hills to East Saltoun. It was so nice I stopped for lunch. The B6355 from East Saltoun took me to Gifford then up a steady climb to the Lammermuir Hills. This was a great climb, and provided some great views. Then a nice steady descent followed down past Whiteadder Reservoir, and suddenly I was in Border Country. The countryside was so much like the Borders where I used to stay when I was a lad. I followed this road to Preston (not that one – still in Scotland at the moment) with only a minor detour as I missed the turning. It’s a funny thing. I probably added about half a mile today with missed turnings, which isn’t very much. But given that each one was only a hundred yards or so, that makes a lot of missed turnings. It begins to get you down and you feel unreasonable. It becomes everyone else’s fault. I wouldn’t have missed any of them if Shaun was still with me. Anyway, through Preston and on to Chirnside, and you could smell the air getting more English. Then, before I even knew where I was I was crossing the border. Milestone reached. Alone. The first thing England presented me with was the A1. Thankfully I wasn’t going down it, just crossing it. At its northern extremity it wasn’t too busy, and I was soon descending into Berwick upon Tweed. Through the town and across the bridge, and then along to the cyclepath that follows the coast. It is a cyclepath. It has a sign that says “Cyclepath”. It was basically a field though. Dramatic scenery and all that, no traffic, but also no surface suitable for a road bike loaded with panniers to cycle on. After about half a mile of this there was gravel, then tarmac, then some old roads. Finally rolled into the campsite at 7.30pm – 12.5 hours on the road. I had managed to bring the average for the day up to 10mph, from its 7mph earlier in the day, but was knackered as a result – both physically but also mentally. Doing the ride alone was not what I had planned. Shaun was there looking ill. We decided he would see how he was the following day. If he was OK he would cycle. If he wasn’t then they would drive down to the next campsite and meet us there.